Patients suffering from Gut Toxicity experience symptoms such as exhaustion, headaches, brain fog, gas, bloating, constipation and a poor immune system. Since the advent of penicillin during World War II, we have poisoned our food supply with antibiotics. Antibiotics that were intended for medical treatment, have unwisely been used for agricultural purposes – poultry, dairy, and stockyard beef production. Because of antibiotic-laden foods, most Americans are suffering from an imbalance of our good bacteria that live in our guts or Gastrointestinal Dysbiosis. This imbalance causes Candida overgrowth. Candida, a type of yeast, naturally exists in our bodies, but can be problematic when it overpopulates the digestive system. During Gastrointestinal Dysbiosis there is no limit to how much Candida can grown and spread. This excessive yeast can cause serious damage to vital organs and tissues, including the brain. Are You Experiencing Gut Toxicity Symptoms? Gastrointestinal Dysbiosis is an imbalance of the intestinal microbiome, the billions of bacteria that live in our intestine. While antibiotics are sometimes necessary, antibiotics destroy God’s intended bacteria, the “normal flora” that are supposed to live in our intestine. Destruction of Lactobacillus, a lactic acid producing bacterium, results in a more alkaline intestinal pH. When the intestinal pH rises, pathogenic Candida and pathogenic Bacteria which normally cannot reproduce in an acidic intestine, overgrow in the colon and small intestine. Candida overgrowth causes Taurine deficiency and three specific pathogenic bacteria, Klebsiella, Proteus and Enterobacteracia cause Serotonin deficiency, when they overgrow the small intestine. SIBO is the medical term for Small Intestinal Bacterial Overgrowth. My brain chemistry research correlating biomarkers with aberrations in brain scan activity has proven that antibiotic-induced changes in brain chemistry cause excessive electrical activity in two specific brain regions as seen in red below. When these brain regions become severely overactive, patients develop depression and a “worry-worry” type of anxiety. When patients develop an overactive deep limbic center, they suffer with depression, moodiness, negativity, irritability, hopelessness, excessive guilt, social anxiety, and they become more easily offended. When patients develop an overactive anterior cingulate, they become more argumentative, more stubborn, hyper focused on the negative, and they develop obsessive-compulsive worry. Patients develop leaky gut syndrome when Gastrointestinal Dysbiosis begins to cause erosion to the gut lining. A leaky intestinal lining will further distort the delicate biochemical balance of the brain. Homeostasis, or balance, between the immune system, the hormonal system and the nervous system begins in, and is critically dependent on, a healthy intestine. 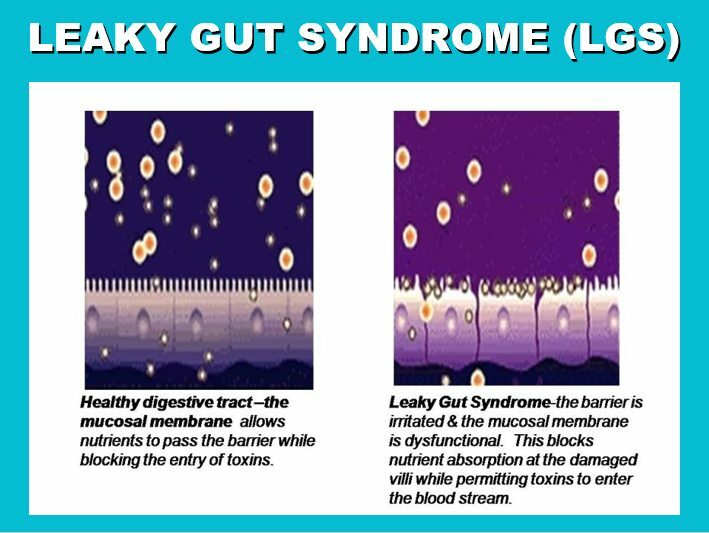 Leaky Gut Syndrome causes chronic inflammation in the gut and throughout the body. It has been linked to a wide range of conditions and symptoms such as chronic fatigue syndrome, Celliac Disease, Irritable Bowel Syndrome, Crohn’s Disease, Rheumatoid Arthritis, Autism, Multiple Sclerosis, Lupus and more. Patients suffering from intestinal Dysbiosis have excessive yeast mytotoxins and bacterial endotoxins that migrate from the gut to the brain. These toxins are lipophylic, fatty in molecular structure and deposit in the fattiest organ; our brain, which is 60 percent fat. These neurotoxins inflame the brain’s white matter, the insulation on brain neurons called myelin, adding to the cumulative level of neurotoxicity. Antibiotic-induced neurotoxicity causes further suppression of the immune system by “shutting down” the electrical current in the brain. This is problematic, because the brain’s electrical activity is responsible for stimulating cytokine activity. Cytokines are the chemical messengers that activate our natural killer cells. When neurotoxins inflame the myelin sheath of brain neurons, they change the electromagnetic field surrounding the neuron slowing the speed of the electrical impulse. By this mechanism, neurotoxins essentially suppress the brain’s electrical activity. In a healthy brain, electrical current jumps over the myelin on brain neurons in rapid fashion. However, when the myelin sheath becomes infiltrated with fatty neurotoxins from the gut, in addition to toxins from the Lyme spirochete, it fails to effectively modulate immune function.